Like so many other writers, I came to writing through reading. 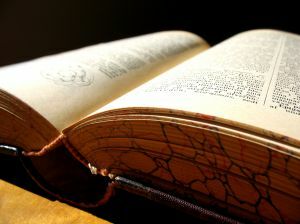 From the time I first learned to recognize words on the page, I was fascinated with those words. And from the time I figured out that somebody actually put those words there, that's what I wanted to be–a writer. I remember back when I was a freshman in college, discovering that I could major in journalism, and more to the point, that there was actually a practical application for my love of writing. But, as I said, before my love of writing came my love of reading. And it reminded me of the tension of reading. 2. Between wanting to start a new book to have the same transporting experience again–but not wanting to leave the world of the book you just finished. When I finished Station Eleven, I wanted to start another book immediately because I wanted to duplicate the reading experience I just had. I'd just been to the library and brought home a stack of books–a particularly good haul, I'd thought. But when I went to peruse my pile and choose what to read next, none of them appealed. Much as I wanted to enter a new reading world, the old one of Station Eleven still lingered. This was really the first time I've identified these tensions in such a direct way. I've felt each of them for years, of course, but never really fully named them. And, as a writer, I'd be remiss if I didn't point out that tension is the most important element of any work of fiction (and I daresay non-fiction, too). I'm quite sure the tensions of reading and writing are related. So those are my Wednesday thoughts this week. Please leave a comment--do you have a weird reading habit? I know one of my loyal readers, who shall remain nameless, reads the end of the book first! So c'mon, fess up–what are your reading habits?